MAKAQueS is a new interactive key to the flora of the British Isles (Great Britain, Ireland, the Isle of Man and the Channel Islands). 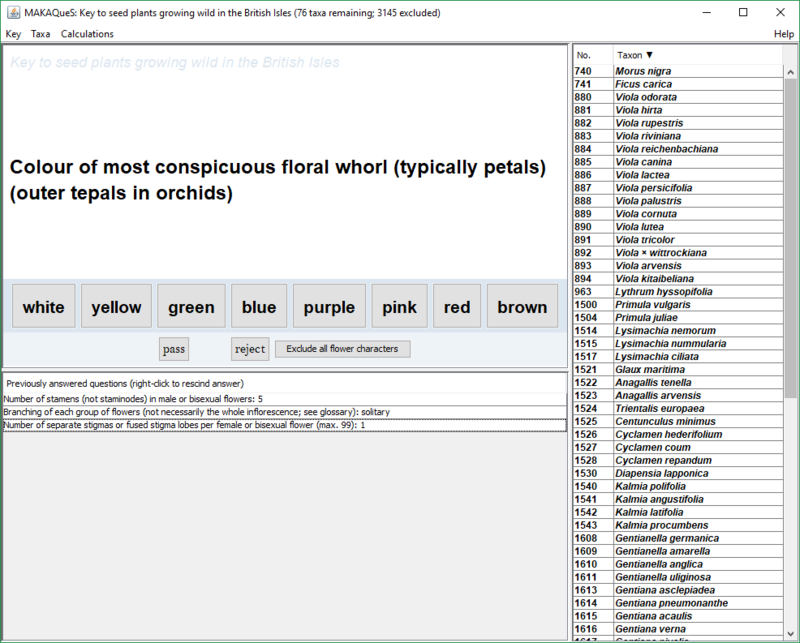 It allows the user to distinguish between 3221 native and introduced species, subspecies and species groups of seed plants, covering all the gymnosperms, dicotyledons and monocotyledons, from Abies alba to Zea mays. MAKAQueS includes a detailed glossary of technical terms, and calculators for converting between units and for calculating the Atkinson Discriminant Function (for distinguishing between the two birch species Betula pendula and B. pubescens). MAKAQueS stands for “multi-access keys with automatic question selection”. 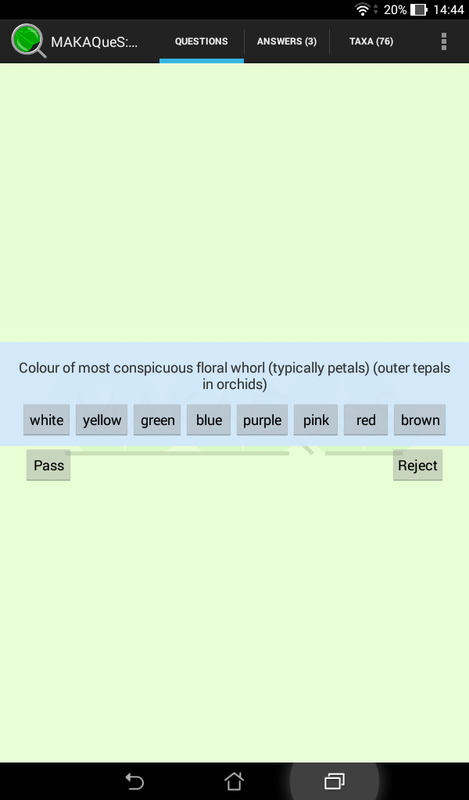 Unlike the keys in books that you may be familiar with, your route through the key is not predetermined when identifying a plant with MAKAQueS; instead, questions are chosen on the fly, depending on the answers you have already given. At each step, the program looks at the taxa that have not been ruled out, and asks you whichever question is expected to reduce the number of taxa remaining the most. This means that you need to answer many fewer questions than with traditional keys. To see how the process works in practice, see the example identification. You can also pass over any question that you are not sure about, and move on to a different question instead, giving you much greater flexibility. For example, if a plant is not in flower, you can ignore the questions on floral parts and answer other questions. MAKAQueS is now available for Android smartphones and tablets. Follow the link to the Google Play Store to install it, for just £9.99, or equivalent in other currencies. As well as the JAR file, you will need a registration key to run MAKAQueS, which will be emailed to you once payment is received. To pay, follow the PayPal link below, and include your email address in the “special instructions to the seller”. You can pay with a credit or debit card; you do not need to register with PayPal. MAKAQueS is currently available to new users for just £9.99.